Two 300-year-old skulls and several bones have been found during a dig in an Edinburgh street. The discovery was made during a special dig in Constitution Street, where bodies were discovered earlier this year during tram works. That find sparked the efforts to discover if any more bodies were buried in the area, where tram tracks are due to be laid next year. Two one-metre-deep trenches have been dug next to South Leith Parish Church. 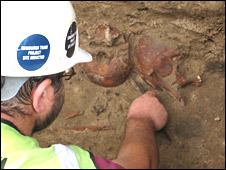 Phil Douglas, Edinburgh tram construction interface manager, told the BBC Scotland news website the £20,000 project had uncovered two adult skulls. He said: "We planned this dig so that if there were any more bodies, which we have now found there are, we had the time to treat them with patience and dignity rather than during further tram works which we are conducting in the area next year. "So this is a derisking operation to find out the scope of the problem. "We have dug two trenches 25m apart and have three road operatives who are trained in digging in sensitive areas. "We also have two archaeologists on site and next week we will have a meeting with the city's head archaeologists over what to do with the remains." How green are the trams?